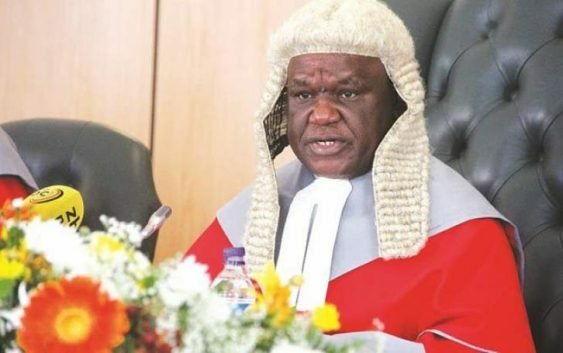 CHIEF Justice Luke Malaba yesterday issued a controversial directive which shocked a meeting of lawyers for the applicant and respondents, as well as one candidate in the recent disputed presidential election, in the case in which main opposition leader Nelson Chamisa is challenging President-elect Emmerson Mnnagagwa’s hotly-disputed victory. The case will be heard at the Constitutional Court (ConCourt) starting next Wednesday at 10am. The matter – which has far-reaching implications for Mnangagwa’s presidency and the nation’s politics and future – might be broadcast live if an application for that is filed or a request is made in writing to the ConCourt and granted. Chamisa is challenging Mnangagwa’s contentious win, saying it was secured through manipulation, irregularities and fraud, charges the president-elect denies. Mnangagwa won with a wafer-thin 50,8%, while Chamisa got 44,3%. The remainder of the vote went to 21 other candidates. The case started on a dramatic note yesterday during a meeting on preparations and procedures, setting the stage for a bruising and explosive battle which may leave Zimbabwe deeply divided and stuck in a deepening legitimacy crisis. Judiciary sources said Malaba stunned the meeting attended by Chamisa and Mnangagwa’s lawyers, as well as some respondents when he gave an “extraordinary directive” that any respondent who would want to make a submission supporting Chamisa in the case will not be allowed to do so. However, any respondent backing Mnangagwa will be allowed to make a submission without any problem. Malaba did not explain why. Those in the meeting did not ask why either, sources said. Lawyers said it was unprecedented and unheard of that a judge, let alone a chief justice, would brazenly want to manage and even influence a major case like that through such an intervention. They said his directive is being studied and could be legally challenged. The order came as Mnangagwa’s attorneys and the Zimbabwe Electoral Commission (Zec) boss Justice Priscilla Chigumba scrambled for technical reasons to get Malaba and the ConCourt bench to refuse to hear Chamisa’s case or dismiss it on technicalities. Some of the technicalities being brandished include that the application was filed late, is incomplete, defective or invalid. Alternatively, they say it has no merit and must be dismissed. Chamisa, however, insists he has overwhelming evidence of flaws, unlawful activities and criminalities – massive rigging – which influenced the outcome of the election. United Democratic Party leader Daniel Shumba, a losing candidate and respondent in the case who was at the meeting yesterday, confirmed Malaba’s directive. “We attended a preparatory meeting where there was the applicant (Chamisa)’s lawyers, the first respondent (Mnangagwa)’s attorneys, Zec representatives and myself, among others,” Shumba said in an interview with the Zimbabwe Independent. “At the meeting, the chief justice, who was chairing and had come alone without his full ConCourt bench, gave a directive which shocked the legal fraternity, constitutional bodies and the democratic sphere. He said any respondent supporting the applicant (Chamisa) will not be allowed to make submissions. The court will only accept submissions from any respondent supporting the first respondent (Mnangagwa). This is unbelievable. We are currently making consultations to see if we can legally challenge this, and if we can request the chief justice to recuse himself. We think he is conflicted. “The chief justice’s directive and role is more worrying when taken together with the relevant background and context of this case. We should remember that he (Malaba) was the one who swore in the first respondent (Mnangagwa) last November (after the coup). “He went on to hear a constitutional application which sought access to the ConCourt to challenge Mnangagwa’s ascendancy. As the same person who had sworn in Mnangagwa, thus giving him constitutional and legal legitimacy, Malaba should have recused himself, but he didn’t. Malaba’s ruling, sitting in ConCourt chambers in the matter of Liberal Democrats and Others v Mnangagwa and Others, raised very serious legal and jurisprudential questions. In this matter, two political parties named Liberal Democrats and Revolutionary Freedom Fighters, together with Vusumuzi Sibanda, Linda Masarira and Bongani Nyathi, sought direct access to the ConCourt to bring an application against Mnangagwa, Vice-President Constantino Chiwenga, the Zimbabwe Defence Forces, Speaker of the National Assembly and former president Robert Mugabe. Malaba had to decide whether it was in the interest of justice that direct access should be given. The alternative for the applicants was to start their case in a lower court. The essence of their case was that Mugabe’s resignation on November 21, 2017 in the midst of a military coup which brought in Mnangagwa to power, was not free and voluntary. They argued that it was a direct result of the military action of November 14, 2017 and the “presence of military vehicles in the streets of Harare between 14 and 21 November 2017”. They also said the subsequent impeachment proceedings were “intended to aid and abet take-over of power by the military”. Further, they challenged the constitutionality and legality of the assumption of power by Mnangagwa on November 24, 2017. However, the applicants were in default on the date of the hearing. No one appeared on their behalf. In order for Malaba to decide whether direct access should be granted, he had to consider the applicants’ prospects of success before the ConCourt. In the process, the chief justice concluded that Mugabe had resigned of his own volition or free-will. He held that the resignation of Mugabe was voluntary as evidenced by the letter of resignation and the communication with the Speaker of the National Assembly on the day. Malaba decided the legality of the coup relying on a court order issued without reasons by Judge President Justice George Chiweshe in the case Joseph Evurath Sibanda and Leonard Chikomba v President of the Republic of Zimbabwe, Robert Gabriel Mugabe N.O. and Minister of Defence and Commander of the Zimbabwe Defence Forces and Attorney-General of Zimbabwe (HC 10820/2017) on November 24 2017. There is a rich history of case law within the Commonwealth, where there have been legal challenges to the unconstitutional overthrow of elected governments. These cases and incisive commentary on them are set out in an interesting book by Professor John Hatchard and Dr Tunde Ogowewo titled Tackling Unconstitutional Overthrow of Democracies: Emerging Trends in the Commonwealth. Hatchard and Ogowewo develop a new theoretical construct – “the implicit bargain theory” – to explain the existing jurisprudence on coups. Their study critically examines the evolution of judicial decisions on the subject. In doing so, it also evaluates jurisprudential theories underpinning these judgments. Most judges rely on the dodgy Dosso jurisprudence which can be traced to the judgment of the Pakistan Supreme Court in State v Dosso, a decision that has been termed “a carte blanche for treasonable conduct”. Malaba and his colleagues almost certainly relied on this and also the doctrine of necessity to justify their decisions. “To understand the nature of the existing jurisprudence on coups, it is important to understand what in fact produced it,” Hatchard and Ogowewo write. “For this, a new theoretical construct – ‘the implicit bargain theory’ – is introduced to tell the story. “Judges are important players when there is a coup. The immediate effect of a coup is to eliminate two branches of government – the executive and the legislature. The judiciary is left intact. Prior to the interview, Shumba had addressed a press conference and emphasised that he would challenge Malaba’s directive. “It does not matter whether I am a respondent or applicant; I have the right to be heard. According to Section 167(a), (b) and (c), rules of the ConCourt must allow a person when it is in the interest of justice with or without leave of the ConCourt to bring a constitutional matter directly to the court, to appeal directly to the ConCourt from any other court, to appear as a friend of the court,” Shumba said. “I will not be intimidated to abandon my democratic and constitutional right.” Source – the independent.